From the source that published the “polished-copper” Nokia 8 photos weeks before official announcement, comes a little bit of information about the upcoming Nokia 9. 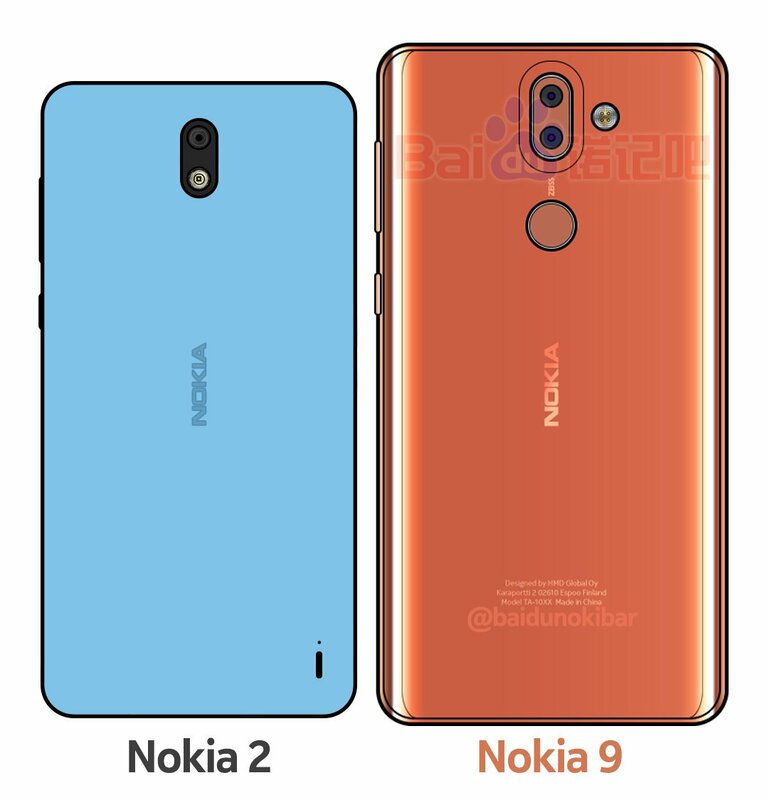 The source posted his sketch of the Nokia 9 on Baidu forums operated by Nokibar, where we can see a fingerprint sensor on the 3D Glass back, and the similar dual-camera setup with ZEISS lens as on the Nokia 8. The put there a 4 x LED (?) flash, but no laser sensor as on the 8. We cannot confirm if the sketched device above really looks like a Nokia 9, or any of the information like the glass back or AMOLED screen, so take it with a pitch of salt. The source also mentions Snapdragon 835 as the processor, and states that the device doesn’t have a “full screen”, probably referring to edge to edge display, that was rumored on the Nokia 9 before. Glass back makes sense if HMD wants to offer wireless charging in its device, as we discussed here. Moving the fingerprint sensor on the back means that there is no room for it on the front, meaning a bigger screen-to-body ratio. That’s why I think the 9 will have higher screen-to-body ratio than the 8, which has 69.4%. Maybe not bezel-less, but with smaller bezels. Also, compared to the Nokia 2 (if the sizes are correct), that’s sketched with the 9, the Nokia 9 look smallish. Nokia 2 is rumored to have a 4.5-5 inch screen, but with bigger bezels. Depending on the size of the bezels on the pictured Nokia 9, it could have a 5.7-inch screen, but it’s just my guess. About the camera, the source says it’s similar or better than the one on the Nokia 8 featuring Sony’s IMX258 sensor or an equivalent sensor. As expected, ZEISS lenses will be used as well. We didn’t hear anything about the announcement or the price. We recently learned thanks to Evleaks that the Nokia 2 could be announced on 5th October, and maybe we will see a Nokia 9 there. Maybe that’s too soon for HMD to announce a second flagship, considering the Nokia 8 isn’t yet available in China, India nor the U.S. Maybe it would be better to wait for MWC18 and use a next-gen SOC like Snapdragon 845 and a bezel-less display like on the V30 or maybe the original Mi Mix. Update: After checking with someone who knows Chinese, the proper translation for the screen part goes: “rumour said it will feature curved screen instead of bezeless screen”. We are still not sure what does “curved” really mean – is it just 2.5 or 2.25D glass like on Lumia 920, or maybe a curved screen like on Galaxy Edge models.